Background: These two articles were published in the ninth of a series of booklets on the war. The date is early 1941. They give a German perspective on war production. The source: “Kamerad an der Maschine” and “Soldatensieg: Rüstrungstriumph,” Wir schmeiden die Waffen. Kleine Kriegshefte Nr. 9 (Munich: Zentralverlag der NSDAP., 1941), pp. 1-3 and pp. 30-32. 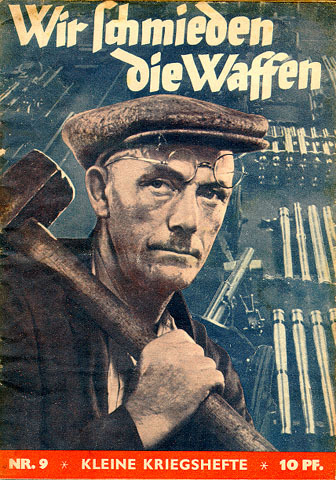 During the period last winter between the Polish campaign and the German counterattack in the west, English propaganda never tired of saying that the weapons and equipment of the German army were inadequate and that problems in the German armaments industry were increasing as the result of a shortage of raw materials, bad material, or insufficient machinery. Even after the 18-day Polish campaign, the illusion-filled British politicians still had not learned. They held to their belief in a “comfortable war” and placed all their hopes in a blockade that would weaken Germany and keep weapons from the German front soldier for a second time. As the German sword fell in the west and all of Englandâ€™s hopes vanished, the whole world recognized that a powerful armaments industry stands behind the German army, an industry worthy of the best army in the world. German armaments and their support base can in no way be compared to the situation during the World War. Then well-planned offensives that the enemy could not have resisted failed because of a shortage of weapons and material. This time, the government has made the necessary economic preparations. German factories have the necessary raw materials at their disposal. There may be nearly inexhaustible reserves or a planned increase in production that will continue during the war. Or there may be import routes that cannot be blockaded. Nor may one forget the material we have captured, for example, the grain and rubber that are an unexpected but welcome addition to German reserves. A few examples of the superior of German armaments production. Steel is the most important material in the armaments industry. Even in 1938, the 23.3 million tons that Germany produced were more than double Englandâ€™s 10.6 million tons. In the meanwhile, the balance has shifted even more in Germanyâ€™s favor. Besides planned increases in production, one need only consider the iron and steel capability we have captured in the east and west  think of Upper Silesia and Luxembourg! The necessary raw materials were guaranteed by the iron ore of Lorraine and Belgium. And the secure route to Swedish sources was guaranteed by the occupation of Norway. German coal production reached 186 million tons in 1938, the level of 1913, despite the loss of important coal regions. It has risen further since the war began as the result of our capture of Upper Silesia and other former Polish coal mining areas. Coal production for the armaments industry and other industries is fully secure for the foreseeable future. Aluminum is an essential material for aircraft production. Germany has been the worldâ€™s leading producer since 1938, when we produced 180,000 tons. Our sources cannot be blockaded. Our enemy hoped we would suffer from a lack of non-ferrous metals, but here, too, we have enough reserves or sufficient domestic production, as for example is the case with zinc. And we have captured large reserves of these metals. For example, we captured about 30,000 tons of copper in Bourges, a single place in France. German armaments production thus has at its disposal sufficient and secure raw materials. To that must be added the superior productive capacity of German industry, with its modern technical equipment and its security against foreign attack. This is particularly true of newer factories that have been built in rural areas safe from air attack. This concentrated industrial strength is led by the will to which it owes its existence, the will of the Führer. It is directed by a comprehensive military-economic organization that is unique. It guarantees that all forces in the Greater German Reich can be mobilized and used for the armaments industry in the most effective way. The important foundations of armaments production are raw materials, industrial capacity, and a military-economic organization. Even more important is the human factor, the German armaments worker. The hundreds of thousands of German workers and skilled tradesmen, men and women, the engineers, technicians, builders  they all comprise the powerful force that is the critical part of our enormous armaments production. They are the dynamic force behind the wheels of industry that are working full speed for the war. Together, they form a sworn community molded together in pursuit of a single goal: to forge the best weapons for German soldiers. The draftee stands next to the skilled worker, perhaps coming from an entirely different occupation. Now he does his duty at the machine. And next to him is a woman who, in many, many cases has volunteered to serve where hands are needed for victory. The daily life of an armaments worker is certainly not easy. The trip from home is often long, the work is hard, demanding the concentrated application of oneâ€™s full strength. The men and women working at the bench or before a mechanical apparatus, before an oven or the test tube, know that they are fighting where the Führer has set them. They know that the Führer, the soldiers, and our people realize the importance of their work. They know that when the day of victory comes, those who forged the swords will stand next to those wielded them. As the German infantry regiments rolled toward the Polish capital, a Polish soldier stood upright in open country. With a machine gun, he fired at the approaching colossus. He collapsed under a hail of bullets. He was one of those Poles who had been misled into believing that German tanks were made of paper ache, German weapons of tin. We heard this again and again from the unending columns of prisoners. It was an article of faith as they faced their “materially weaker opponent.” One saw how hard it was for the columns of prisoners to learn the truth. A detachment of Polish field artillery was destroyed by German weapons along a country road near Warsaw. The dead soldiers and wounded horses, their big guns and machine guns, their bazookas and rifles, were strewn about. The summer heat spread the odor of the battlefield about, a mixture of fire and desolation. Countless bullets and shells of every description were scattered about. We saw individual artillery pieces that were somewhat intact, with shattered wheels and battered barrels. One gun bore an English mark, another French. Another was a German piece dated 1913. It had been stolen by the Poles. There were Swedish guns and Czech and English machine guns. They were divided according to their manufacture. How that made matters difficult, not to mention the rifles from every leading armaments producing nation. They were the weapons of a nation that had to import its weapons from other countries. The Polish soldier had to rely on foreign workers and foreign quality. The German soldier knows the men who make his weapons. They speak his language. They mass produce the weapons with which Polish weapons were defeated. There is no multitude of various types. Someone keeps an eye on things. Twenty-four 16.5 centimeter guns were built into an area behind Sedan. They were intended to fire on advancing German columns. Their fire surprised us as we crossed the Belgian-French border near La Chapel le. They tore some holes in the German ranks, but they were not able to stop our advance. As we took the Maas heights and reached the second French defensive line, these guns were before us. The crews had fled. Ammunition, supplies, food, and utensils had been left behind. As we examined the positions, we could see how the enemy had used 22 years to modernize his weaponry. The enemy had 22 years to work daily on his weapons, until he reached the point at which he thought he could begin a war with Germany. We had only seven years. The enemy had a head start of 14 years, during which time German reparations payments were at his disposal, the money that about 60 million Germans had earned with the work of their hands. Nonetheless the enemy was not better than we; we were at least his equal and were able to defeat the enemy with our new weapons. We soldiers know that as much work was done by us in the 2,555 days we had as was done by the French in 8,030 days. German soldiers on the battlefield thanked the armaments workers for their almost unbelievable efforts. In the dunes of Flanders near Dunkirk, we found an English cable and telephone system. A German radioman smiled at the English field radio equipment. The captured Tummies reported that as a result of the chaos of battle and their shrinking territory, the communication system had failed totally. We recalled the battle on the Basra, where the Polish commandâ€™s orders could not reach the encircled troops. The English and the Poles agreed that in both battles of annihilation, German fire had quickly destroyed their communications. That explained much of the failure of the troops and the panicky flight of our opponent. The fact that these battles went as planned on our side is due primarily to our flawlessly functioning communication equipment. That made it possible to relay orders to the proper units. We knew from the World War what happened when communications fails. We learned from those experiences, and during our years of rearmament worked to produce the best communications equipment in the world. With unparalleled endurance and devotion, the workers in the cable factories and in the radio industry worked to manufacture high quality equipment. We watched the triumph of the German munitions workers on 5 June as we stood in the tower of Amiens Cathedral. Several hundred German guns were sending their death-bringing cargo over our heads toward the French Weygand Line. They destroyed enemy batteries and machine gun nests, opening the way for our tanks. Later we saw French tanks destroyed on the battlefield. Our bazookas had torn through their steel armor. Can there be any greater reward for German armaments workers than the consciousness of having created such effective weapons?! It was recently revealed that the former Jewish Minister President Leon Blue had given armaments orders to a Jewish metal works. The Jewish firm did not always complete its work punctually. But the Jewish firm did punctually receive one payment after another from the French treasury. The Jewish armaments baron got his money despite unreliable deliveries. The French soldier paid with his life. As we were thankful to learn on the battlefields of Poland and France, such things are not possible in Greater Germany. Our government took care that no one made improper profit from German blood. Here, too, we learned from experience. But how depressing it must be for French soldiers to hear these reports, since they had to pay. But what a triumph battles like those of early June along the Aisne and Somme rivers are. Our armament workers’ greatest satisfaction is to forge such weapons for our soldiers. The German soldier thanks them now and always for the fact that he can rely on the quality of their work in battle. He knows that he can depend on them. His blood protects the work place, it protects the dangerous work in the armaments factories of Greater Germany. In the end, it protects the lives of the workers and their families. It was not and is not dead material with which we go into battle. No, the weapons and equipment are filled with the spirit the workers bring to the material. They are filled with the spirit the fighting soldier gives them. Spirit and innovative equipment has helped us to the great German victory.